Aggregate Industries has once again proven its ability to meet even the most complex specification requirements in its recent work at Harburnhead windfarm. Located 20 miles South West of Edinburgh, Harburnhead in West Lothian is a vast, rugged open terrain. A Joint venture involving Enel Viento and FIM Services made the decision to utilise the 7km2 remote area of moorland for redevelopment as a major windfarm project, hosting 22 turbines, with a 52MW capacity, able to provide power to approximately 30,000 homes for the next 25 years. As the awarded concrete supplier on this project, the Aggregate Industries team was tasked with providing 480m3 of ready-mixed concrete needed for each of 22 turbines bases. However, this was no simple feat due to prohibited direct access to the site using the nearby A71 which added a further 10 miles to the journey from the supplying plant Duntilland. Nonetheless, the Aggregate Industries logistics team was able to overcome these road restrictions to meet the project needs. The specification of concrete was equally challenging. 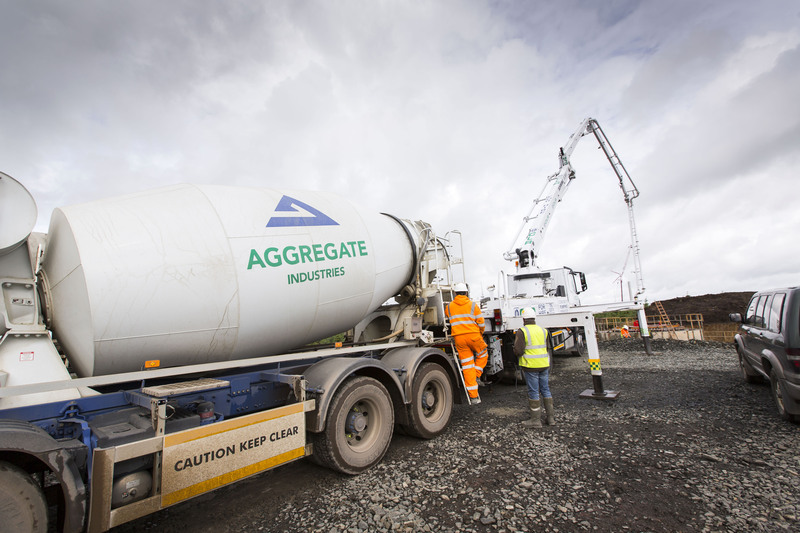 After careful consideration and extensive trials, the Aggregate Industries Technical team designed a bespoke concrete mix incorporating BASF’s MasterGlenium 126 admixture. This guaranteed the concrete was supplied within specification even with the road restrictions adding significant time to the journey. Adding further pressures, Aggregate Industries was granted access to the site in December 2015, with an extremely tight programme, which called for turbines to be erected by August 2016 ready for the energisation date of September 2016. In response, the team came up with a swift plan of action; 12 truckmixers and two plants were used to complete the turbine base pours in an allocated 12 hour window, whereby, for the bulk of the contract, one to two turbine bases were poured per week. In total, the team supplied over 10,500m3 of concrete in a project worth over £1million.